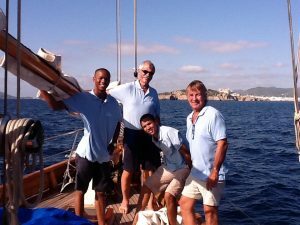 With our first project event at the Ibiza Rendezvous Regatta concluded last week, and recognised by all as a resounding success, our first two student sailors have now returned home to South Africa. A big thanks to the Ibiza Rendezvous team and to all of those who supported and sponsored this first great event. Spike Thompson and the organizers -Amanda, Melanie, and Alex – of the Ibiza Rendezvous for sponsoring our entry fee for the regatta.